Bookcase with Glass Doors and 3-Shelfs in the top section and 2-Shelfs in the Bottom. Beautiful Design. Colors can be mixed and matched or Solid Color as you like. Please see color chart for available colors. Strong Construction. Made of Melamine or Solid Birch Wood. This Bookcase Is Also Available In Custom Size and with or without the Glass Doors. If You Would Like A Particular Size, Please Indicate The Size In The Shipping Comments Box Or Contact Us Via Email Or Telephone. 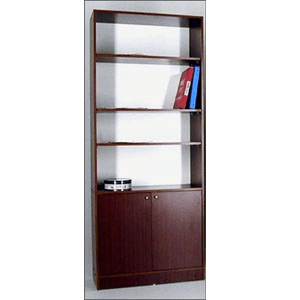 This Bookcase Is Shipped Fully Assembled.Size: 31 In.(W). x 14 In. (D) x 72 In. (H) *Local Delivery Or Store Pick Up Only. Click Here For Delivery Areas.Hand Crafted In The USA Normally Takes A Week To Make. Bookcase With Doors. Beautiful Design.